This is where the requirements to drive become a lot stricter and a lot more expensive. While some cars from Uber Select will qualify for Uber Black, you still have to hold a higher standard to drive on this platform. But, just like how the platforms before had higher fares, this ride-share platform will theoretically make you even more money. This page will be dedicated to showing you what the Uber Black car requirements are to qualify to drive. Uber Black is what can sometimes be called “The Original Uber”. You won’t be driving a Prius or Camry if your on this platform. It’s a lot more luxurious and all the cars are required to be black. Hence the name. Each Uber service has a different set of car requirements. Uber Black is meant for the more professional drivers out there, which is also the reason why it cost more to use as a passenger. Before you even get to the eligible car you need to have higher standards with the black colored car and commercial car insurance. So, of course this means higher standards with the types of vehicles that qualify to drive as well. Below is a list of eligible cars to drive for Uber Black. Note: not all cars listed below will be eligible in every market. Please check with your local Uber rep. So there you have it. Those are the car requirements for being an Uber Black driver. Unless you already have the permits, carry the commercial car insurance, and own one of these more high-end sedans, I would not recommend starting on Uber Black because it is a lot more costly, but can theoretically make you more money with the higher fares. 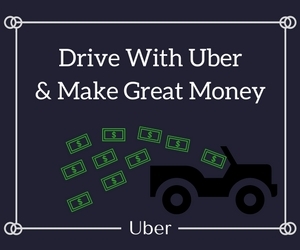 Click on the link to Learn How to Become an Uber driver in 3 easy steps. If you have any questions leave a comment below. Check out the Uber SUV car requirements next!